cleaning may not always be necessary. System is proven and cost-efficient. ducting to a 16-gallon container. address odor or microbial concerns. “I cannot thank SERVPRO of North Morris County (Rockaway) enough for the fantastic job they did! My house had several pipes burst while I was away, and the entire house was a mess! They came out quickly, worked with me on all information, and performed everything in a professional manner. Like most people who need SERVPRO, this was a very difficult time for us - and SERVPRO helped ease the pain a bit. “My 2nd Floor Laundry hose failed and flooded my downstairs for 20 minutes causing major damage to my LR/DR ceiling and floors. This happened in Jan 2019 right before scheduled surgery. The SERVPRO team headed by Leon was prompt, neat, and did everything they could to clean up the all damage and relieve me of any concerns I had about possible mold growth. Leon in particular, went out of his way to make things easier for me during a challenging and stressful time. “I want to thank Joe, Bill and the crew for handling the water damage resulting from a washing machine hose. You delivered and made it as advertised..."Like it never even happened!" We thank our customers for their high praise, and for trusting us to get the job done right. If you would like to become one of our satisfied customers, visit our website or give us a call at SERVPRO of North Morris County 973-983-5657. We will answer all of your questions and guide you through the process. Like us on Facebook or Follow us on Twitter, or Google+, and follow the tips, tricks and advice we share with our community. Thanks to Lynyrd Skynyrd, that phrase prompts a song, and an air guitar. In terms of our homes or businesses, it should prompt an evaluation of the source of the smell. We’re not talking about the passing odors of everyday life: our co-workers liberal use of cologne; stuffed cabbage leftovers being reheated in the microwave; air fresheners in the bathroom. We’re talking about serious, strong, lingering odors that have no obvious source. For homeowners, this can be a real mystery. Did that little kitchen fire cause a permanent odor? Is there a dead mouse somewhere in my home? Did my cat spray the wall? Is my septic system starting to back up under my foundation? This year, we will be celebrating 15 years since we opened our doors and sent our technicians and trucks out on the road for the first time. It is a time for celebration, but also of reflection. One of our first jobs when we opened our doors involved an elderly woman living in a house with 37 cats (dead and alive). No family member had checked on her for some time. She suffered a medical incident which caused her family to finally remove her to a nursing home. Then came the clean-up effort in order to get her house on the market. Not an easy task! And yes, the smell. SERVPRO of North Morris County was called upon to check out the property to see if anything could be done. The odor was so strong it lingered in the air outside the home and in the neighborhood. Clothed in Tyvek suits and respirators, our team tackled the difficult task of inspecting the home and coming up with a plan of action. Where many other contractors may have knocked the house down and started again, our crew worked tirelessly to get this property back to livable condition. It was a long and arduous project, but the job was completed. The woman’s family was grateful for a job well done and was able to put the house on the market “Like it never even happened.” If you walked into that home today, you would never know its history! And of course, it is a part of our history as a business, trying to help members of our North Morris County community solve their problems from day one, and continuing to help them live their best lives. 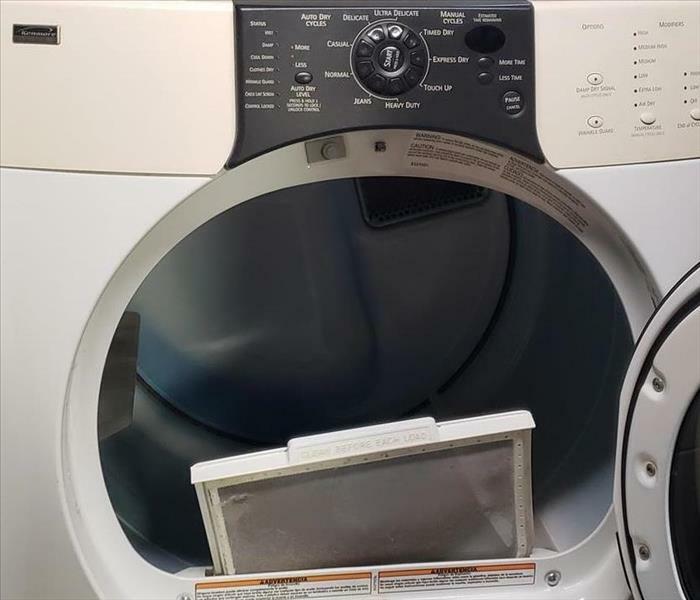 An Ounce of Prevention....clean out that dryer filter after each use. According to FEMA, failure to clean home dryers causes 34% of home dryer fires. Home dryer fires cause $35 million in property loss and can even cause injury or death. To reduce the risk of these fires happening in your home, SERVPRO® of North Morris County can help clean dryer vents and ducts that may have lint buildup. Other tips for keeping your dryer vents clean from the National Fire Protection Agency include cleaning the lint filter before and after each load and making sure the outdoor vent flap will open and is not restricted by snow, a bird’s nest or other potential obstacles. Here in Morris County, the snow has finally melted. Now is a good time for this outdoor inspection. Remove all excess debris and leaves that may have built up over the winter. We’ve all been there. Upon entering the restroom at the office, or our favorite department store or restaurant, or any other place frequented by the public, we notice dripping , stuffed and sometimes overflowing toilets, and faucets that have been left running: a perfect set-up for the disaster scenario your employers have always warned you about. Each one of these scenes can lead to hazardous, contaminated water damage. As business owners or managers, we know that water intrusion can add up quickly not only in terms of damage to our property and contents, but also in terms of revenue lost if we must close our doors while the remediation work takes place. At SERVPRO of North Morris County, we have IICRC Certified technicians who are trained and experienced in state-of-the-art responses to any type of water damage, whether it be sewage, drainage, or storm. Our team has responded to water emergencies from simple accidents such as an employee leaving a coffee mug covering the drain, filling with hot water in the break room over the weekend causing the entire office and the one below it to flood; to major disasters such as Hurricane Sandy and its effects in our own area on homeowners and businesses. Check Breakroom faucets, refrigerators and water coolers for any signs of water leaks. Be sure all faucets are in the off position. Check Bathroom faucets and toilets to be sure they are not running water. If you hear water running, there must be an explanation for it. Know where your shut-off valves are (for both sinks and toilets). A quick-acting manager or employee can minimize damage by cutting it off at the source. Water damage can happen anywhere at any time. For an in-depth consultation and Emergency Ready Profile® (ERP) analysis for your business, please call us! SERVPRO of North Morris County is available 24/7 365 days a year. Give us a call at 973-983-5657. We are Here to Help!! average more than $75,000 (NFIP). in business as soon as possible. natural disasters in the United States. Whether your home or business is near a coastline, along city streets, in the mountains, near a river or even in the desert-there is always potential for flood damage. Floodsmart.gov reports, in the last five years, all 50 states have experienced floods or flash floods. stop, turn around and go another way. Six inches of swiftly moving water can sweep you off of your feet. a flooded road and waters are rising rapidly around you, get out of the car quickly and move to higher ground. Most cars can be swept away by less than two feet of moving water. If a flood does strike your home or business, contact SERVPRO of North Morris County. Even minor floods have the potential to cause major damage to a structure when not treated quickly and properly, and the cleanup is often an overwhelming task. We are prepared to handle any size disaster. When fire and water take control of your life, we will help you take it back. understanding what type of water you are dealing with is critical to ensuring proper cleanup. disaster. Black water should always be handled by trained professionals. -Shut off the water source if possible or contact a qualified professional to do so. -Turn of circuit breakers for wet areas of the building if access to the power distribution panel is same from potential electrical shock. Do not enter rooms with standing water, as electrical shock hazards may exist. -Remove as much excess water as possible by mopping and blotting. Wipe excess water from wood furniture after removing lamps and tabletop items. -Remove and prop up wet upholstery cushions to allow more even drying. -Move any paintings, art objects, computers, documents and other valuable items that may be sensitive to moisture to a safe place. -Do not leave books, newspapers, magazines or other colored items on wet carpets or floors as they may cause staining. -Do not use your household vacuum cleaner to remove water as there is potential for electrical shock or causing damage to the vacuum cleaner. -Do not turn on ceiling fixtures if ceiling is wet; do not enter rooms where ceilings are sagging from retained water. -Avoid all contact with sewage and items contaminated by sewage. Wash your hands thoroughly if you come in contact with contaminated items. -Do not walk through contaminated areas, as you could spread damage to unaffected areas. -Do not turn on the HVAC system if there is a possibility of spreading contaminated air. -Do not use household fans to dry the structure; air flow could spread contaminants. -Discard any food and/or products for personal hygiene and cleanliness if exposed to the contaminated aras. When you have a water damage, don't leave your property to chance. Call SERVPRO of North Morris County. Given the data about the seasonal potential for flooding, as well as its power to disrupt the operation of your business, you may be wondering what you should do to be prepared in case catastrophe strikes. Luckily, our team at SERVPRO of North Morris County has got you covered. The SERVPRO® Emergency READY Profile® (ERP) will help ensure you are “Ready for whatever happens.” In the event of an emergency, the ERP can help minimize business interruption by having an immediate plan of action in place for your facility. The ERP is a comprehensive document containing critical information about your business, including emergency contacts, shut-off valve locations and instructions, and priority areas of concern. Call SERVPRO of North Morris County today to establish your Emergency READY Profile®! 4/11/2019 - Do You Have Dirty Ducts? 3/25/2019 - Eww, That Smell! 3/25/2019 - Celebrating and Reflecting....15 Years!